Jules-François Crahay, designed for Nina Ricci's 1962 "Tomboy" collection. (closed); designer, Nina Ricci, Paris, 1952-63; joined Lanvin, Paris, 1963; head designer, 1964-84; formed ready-to-wear company, Japan, 1985. Awards: Neiman Marcus award, Dallas, 1962; Maison Blanche award, New Orleans, 1963; Dé d'Or award, 1984. Died: 5 January 1988, in Monte Carlo. "Le Dé d'Or á Jules-François Crahay: vingt ans de création," in L'Officiel (Paris), September 1984. "Jules-François Crahay Dead at 70," in WWD, 7 January 1988. Obituary, "Jules-François Crahay," in The Observer (London), 31January 1988. Jules-François Crahay made his name as a designer, not through the establishment of a label under his own name, but through his work for two of the more elegant Parisian haute couture houses, Nina Ricci and Lanvin. His polished, graceful eveningwear, young and unrestrained, was particularly sought out by many soignée French society ladies in the 1950s, 1960s, and 1970s. Crahay is an interesting, well-known example of many designers who worked for fashion houses in virtual anonymity. It should be remembered that many couture and ready-to-wear fashion houses have been supported by a vast retinue of designers and assistant designers, whose talent and vision have elevated the established name of a house into the annals of fashion history. Crahay was born in Liége, France, in 1917, to a dressmaker mother and industrialist father. After attending university and a fashion design school in Paris, from 1934 to 1935, he returned to Liége and a position in his mother's dressmaking business, remaining there until 1951 when he was offered a position as salesman at the house of Jane Regny in Paris. 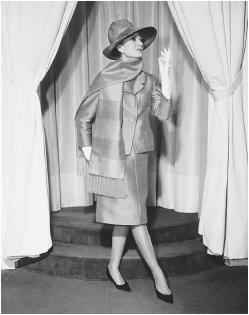 In 1952 Nina Ricci employed Crahay as a dress designer. Initially, he assisted Ricci with the collections and reorganized and rejuvenated the workshops. He was eventually entrusted with the ready-to-wear and presented his first collection in 1959. The range proved a peak in Crahay's design career. It featured low plunging necklines that foresaw the gypsy styles of the early 1960s; it also highlighted Crahay's unique understanding of pattern cutting, cloth, and garment construction. In October 1963 Crahay succeeded Antonio del Castillo as the designer at Lanvin in Paris. Jeanne Lanvin had created her Maison de Couture in 1889 and since then it had conveyed the prestige and traditional image of French elegance. Crahay did little to revolutionize this tradition; instead he emphasized and flattered it. His first collection for the house, spring/summer 1964, met with an enthusiastic response from both buyers and the international press, and verified his position as one of the top Parisian designers, though he did not work under his own name. Crahay was one of the first designers to glamorize trousers for eveningwear. Elegant slacks, in sequined or pleated silk, proved bestsellers. He also innovated and reintroduced leg o' mutton sleeves in organdy, bejewelled leather gauchos, and alluring jumpsuits for evening. When it came to his studio work he established a reputation as a demanding taskmaster. He adhered to the best haute couture traditions, where nothing was left to chance and original, fine details were researched and executed with the greatest care. When asked about his work he replied simply, "Look at my dresses; they are what I have created and they are much more important than anything I can say." Crahay's achievements have been recognized with several important fashion awards, including the Neiman Marcus award in 1962. In the early 1970s he succeeded in seeing his own name on a label, when Arkins of New York commissioned him to design a ready-to-wear collection for their department store. Jules-François Crahay died in January 1988, at the age of 70, in Monaco, Monte Carlo.